Climbing Llwytor and Drum in the Carneddau via Aber Falls. It was a hot August Saturday. Anne, Greg, Ian and I had arrived in North Wales three days earlier to spend time walking the countryside of Snowdonia. 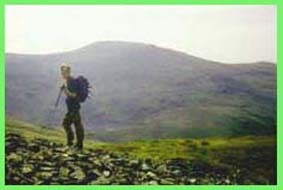 Usually when we come to North Wales we are waiting for good days - fine weather - so we can walk the mountains. This year would be different. The weather had been tropical for weeks, not only in our native Warwickshire but also in Wales, and rather than waiting for the weather to improve we really wanted it to get cooler. But my eldest son, Greg, who was studying at Bangor University and walking the mountains when studies permitted, was, like me, getting frustrated to go "upwards". So it was decided that while my wife, Anne, and youngest son Ian walked from Trefriw, where we were staying, to Llanrwst we would drive to Aber and walk to Drum via Llwytmor. Why these two mountains the reader may wonder. Neither are particularly high or breath taking in their location. That is quite correct, but some years ago I purchased "Hill Walking in Snowdonia" by E.G.Rowland who describes the 53 peaks in Northern Snowdonia he had climbed. Llwytmor, at 2750 feet, is, according to Mr. Rowland's list, the 18th highest and as Greg and I had done the previous 17 - plus a few others - it seemed an appropriate one to "bag". Drum, at 2529 feet, however fascinated me with its name and also because it was the last of the 53 climbed by E.G.R., who completed all but one of these "peaks" between his sixty-fourth and sixty-eighth years. So at about 9.30 a.m. we found ourselves motoring the twenty or so miles from the Princes Arms at Trefriw, our holiday base, to Aber, and a parking space near the bridge at Bont Newydd. The last time we were at Aber was in February. At that time the conditions were very different. Now the beauty and danger of snow on the hills, and the cold that accompanied it, was gone and the need for clothes was minimal. Today was a day for shorts and short sleeves. However Greg was wearing his multicoloured micro fiber trousers which guaranteed it would be difficult to lose him even if his energy became too much for me and he got too far in front. After crossing to the east bank of the river we proceeded towards the "Falls", which today were attracting many visitors. However, after about 1/2 mile we took a fork to the left, which lead away from the main Aber Falls route, and we gradually ascended the path leading into a Forestry Commission plantation. Although the shade of this walk through the conifers reduced the power of the sun it was still very hot and the insects of the forest were annoying. However, it didn't seem long before we reached the edge of the plantation to find ourselves well above the low-level path to the falls and faced with a walk across a scree slope to reach the top of them. Although we had never been along this path before we had been aware of it from below and it had always looked very precarious when we had seen others traverse it. However, in reality, although one had to take care, we did not find it difficult and were able to enjoy the views without being too concerned with our location. 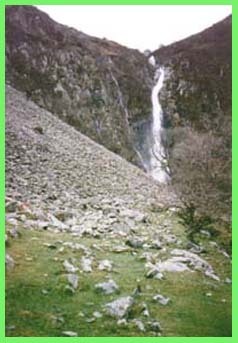 Once we reached the top of the falls we were confronted by the beautiful Cwm yr Afon Goch with Bera Mawr and the Drosgl Ridge on the right of the river, Garnedd Uchaf and the main Carneddau Ridge in front and to our left Llwytmor Bach and Llwytmor. We had decided to walk a mile or so along the Afon Goch until we reached some waterfalls before heading east to Llwytmor's summit. The walk along the jumble of tracks by the river was very pleasant. No one else was about to listen to the river making music as it flowed swiftly around rocks and minor rapids on it's way to the plunge at Aber Falls. Although the river is only 4 or 5 miles long, in its short length the river has three names. In its infancy in the mountains it is Afon Goch, between the Aber Falls and the bridge at Bont Newydd it becomes Afon Rhaeadr-fawr and from that bridge until it reaches the sea it is Afon Aber. But whatever the name, on a day like today, the nicest part must be high above the "Falls". It was almost with sadness that we said goodbye to the infant river with its rapids and plunge pools to start the climb to the top of Llwytmor, but we promised ourselves we would come again another day and maybe follow the water all the way upstream to Garnedd Uchaf. The climb on Llwytmor was not difficult, only tiring under the hot sun. We would occasionally stop to admire the views below and across at the craggy Bera-Mawr. We clambered over at least 3 rocky scrambles between the grassy slopes before we reached the top where we sat in the "nest" of rocks on the summit. Although the visibility was good over the mountains there was a slight haze over the sea, but with a sweep of our eyes we could pick out a large white house, situated on the Angelsey shore opposite the mainland coast at Bangor. We could also see the Great Orme at Llandundo. We sat there for quite some time enjoying the views and eating. Refreshed and rested we started walking southeast to the col between Llwytmor and Foel Fras. As we had visited Foel Fras previously we decided to skirt to the left (north) of it and get on the main Carneddau ridge between Foel Fras and Drum. This was a comparatively easy walk. Once we were off Llwytmor we met many sheep grazing in the hollow between Llwytmor and Foel Fras. Having dodged these and the many peaty hags in this hollow - though most of them seemed dry - we started up the north shoulder of Foel Fras. Here again there were many sheep so we gave them the "widest berth" possible. I know sheep are supposed not to generally attack walkers but we did get charged by a group once in our native Warwickshire and since then we have tended to be a little cautious when in the vicinity of them. It only needed one brave one and if the rest followed we could have found ourselves running over the Carneddau chased by a flock of sheep. So why risk a confrontation. Llanfairfechan and Lyn Ogwen at the base of Penyrolewen. How good it would be to be able to park your car at Llanfairfechan, take a bus to Lyn Ogwen and walk all of the seven 3000ft tops of and Carneddau and finally drop down into Llanfairfechan, or one of the other resorts to the west of Conwy, which would benefit from the trade such a service would bring. And yet the leisure industry still continues to make every facility available to attract more people to Snowdon when it would be so much better for all the visitors, and the local communities and Snowdon, if they were spread about a little. Snowdon is over used and will continue to be so unless positive action is taken to divert visitors to other parts of North Snowdonia. It was strange reaching the top of Drum. Having followed the path northwards, with a wall on our right, on reaching this "top" we crossed the wall into a small enclosure and sat in the middle of the rock "nest" which was the top of Drum. I don't know what I expected but it was very ordinary and I suppose what made it worse was a track which would be suitable for many four wheel drive vehicles which finished only a few yards from the "top". Still I suppose it was better than a railway line. Probably the best views from Drum are westwards, down the slope to the hollow containing Llyn Anafon overshadowed by Llwytmor, and north west to the small Foel-ganol range beyond which we could see the sea sparkling in the afternoon sun. To the east we could see the Conwy Valley and I fantasized yet again on the benefits of a decent public transport service around this massif. Although we could have immediately followed the "four wheel drive highway", we went off Drum with the wall still on our right and made a brief stop at a pile of stones shown on the map as Carnedd y Ddelw which is just over 2250 feet above sea level. From here it was downhill all the way following the track which skirted to the east of the Foel-Ganol Ridge before meeting the power lines. These gave the impression of giant meccano men marching across the landscape as they accompanied the Roman Road, which crosses the northern edge of the Carneddau. 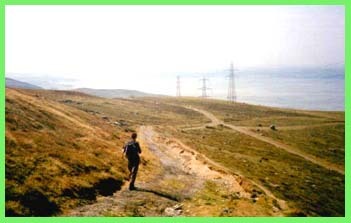 The pylons start in the area of Bangor and finish at the aluminum smelting works at Dolgarrog in the Conwy Valley and in between they spoil this part of the Carneddau. It's almost impossible to take a seaward photograph without "snapping" part of a pylon or one or more of their linking tendrils. The views would be so much better without this intrusion. Less than an hour later we were walking down the steep lane, with the Afon Anafon on our left, which would become the Afon Aber when it reached the Bont Newydd confluence with the Afon Rhaeadr-Fawr. It had been a good day. Once away from the "lets walk to Aber Falls" groups we had seen less than a dozen people all day. The views may not have always matched Snowdon's best but we had probably enjoyed them more because of their comparative solitude. 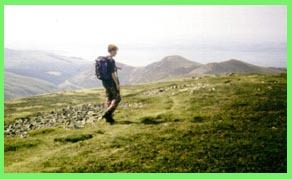 Although I would hate to see the Carneddau become busy like Snowdon, the potential to attract walkers there, away from Snowdon, and at the same time help revitalize many of the coastal communities seems to be ignored. N.B. This was written in 1995, or soon after, and so my comments about public transport, or lack of it, may no longer be relevant – I hope.